The other day wandering in the city I found a chef kitchen’s place. Found a paella pan that I wanted to buy but since I wasn’t ready I couldn’t . This morning thought about it so went to measure my Bessemer pan. Now I’m ready to buy. I wanted something just a tiny bit bigger than my existing pan. I bought this set of Bessemer when I first got married, 23 years ago. They are still going. The new ones are not as good. They are lighter but they don’t last as long I find. The old ones are very heavy but worth their weight in gold. After I buy the pan I’ll have to pop back to the Spanish groceries to grab more chorizo. Theirs was very yummy. 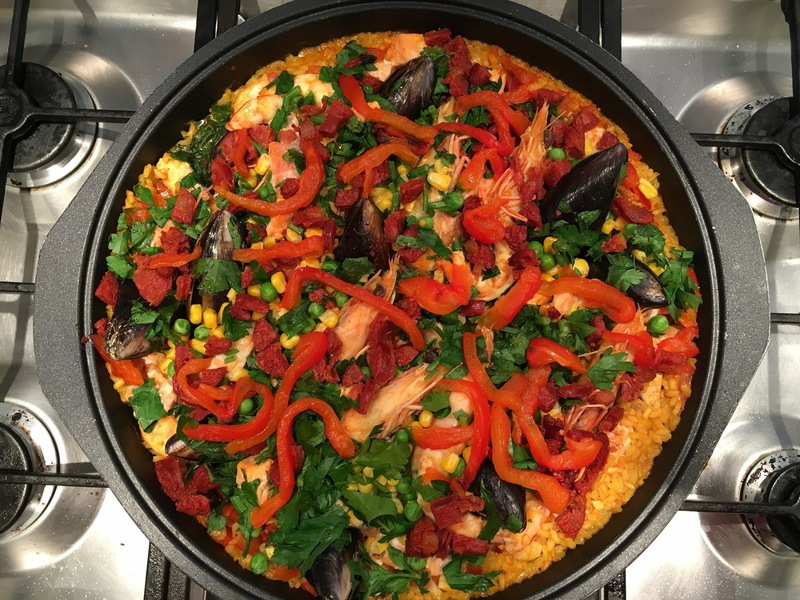 This is my take on the Paella. Next time I’ll add even more spice. Pop 1 capsicum (halved) flat on tray into a 180C oven skin up. Once blistered take out and peel skin off and shred for garnish. The other capsicum dice finely for cooking. Add the saffron threads and salt together in a mortar and grind until fine then add the seasoning and paprika. Finally add in the stock to dissolve all the spices. Some oil, sautee the garlic and shallots then pop the chicken in once sealed add in the rice and capsicum. Cook for a few minutes stirring occasionally. Add in the stock, tomato paste and stir for the very last time. Cook on low heat until can see rice grains popping through the stock. It means it’s ready for the seafood. Add the seafood in by poking it into the rice. 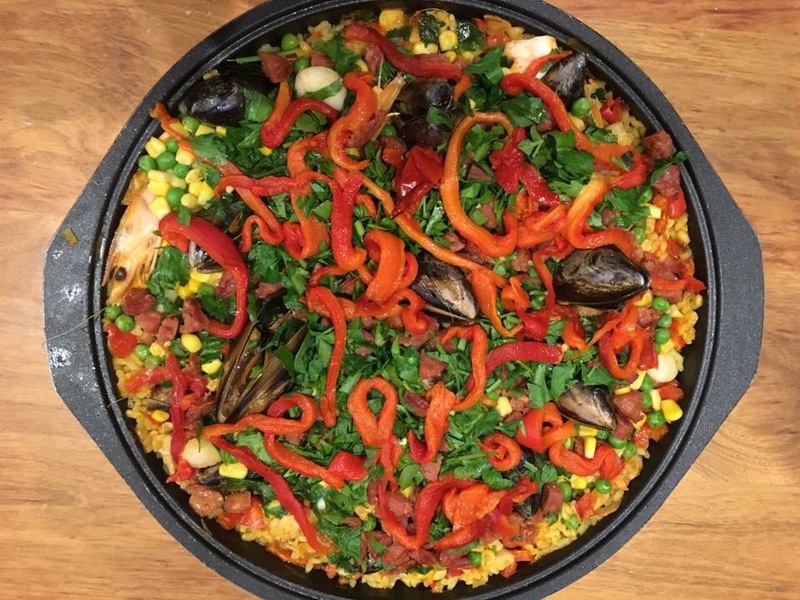 Once seafood is nearly cooked add the peas, chorizo, parsley and garnish with the shredded capsicum. Cook for a few more minutes and take off the stove.